If you just found out that your horse is going blind, you should know that caring for a blind horse is really not any more difficult than caring for a sighted horse. There are some common sense precautions you have to take, but there’s nothing that should keep you from providing a safe and loving home for your blind horse. My horse is going blind – what should I do? Will my blind horse have a good quality of life? Can my blind horse stay with the rest of the herd? Can my blind horse go out to pasture? What kind of fencing should I have for my pasture? What kind of fencing should I use for corrals? Can I ride my blind horse? First, get the best veterinary care you can – right away. Eye diseases are often painful and need immediate intervention. The earlier the animal gets medical attention, the better your chances of keeping its sight. Because the process of losing sight can be frightening for the animal, bring the horse into a corral or stall. This will keep it out of harm’s way and allow you to closely monitor it. Keep other animals away, except perhaps for a single buddy. This is also a scary time for you. Your friend may be in pain, and even if not in pain, the animal will be upset and confused and nervous. So this will be upsetting for you, too, and you may also feel helpless if you can’t do anything to prevent the blindness. This is when well-meaning relatives and friends will step in to tell you that the only “humane” thing to do is to put your friend down. Your vet may also say the same thing. They’ll tell you a blind horse will be unhappy and will only get hurt. During this crisis – and that’s what it is – you should not feel pressured into making a decision about ending your blind horse’s life. Give it time to adjust to the darkness. Give yourself time to adjust, too. You will find that your horse will come around just fine, and pretty soon you will, too. In fact, your blind horse may adapt faster to its new disability than you will. We found that in working with and around a blind horse, talking to it is the key. If you let it know where you are and what you’re doing, you won’t surprise it. So we’re constantly talking with our blind ones. When working with them, we also touch them a lot, both for re-assurance and to let them know where we are. 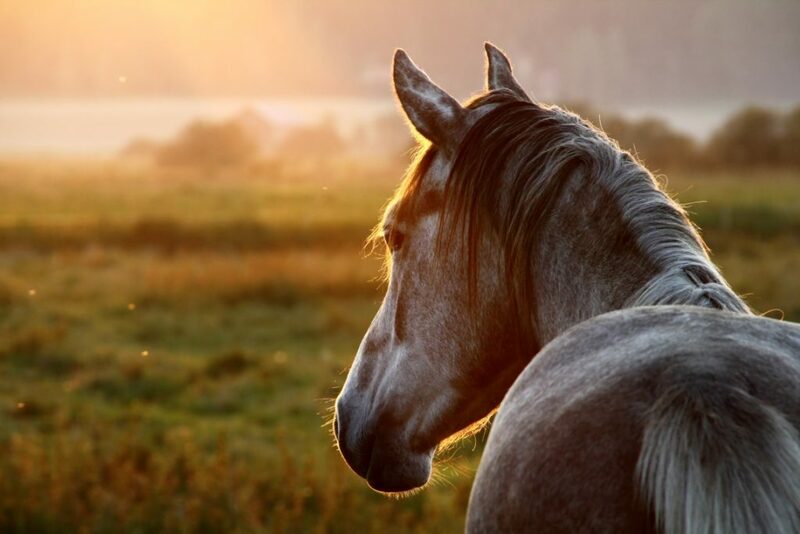 You’ll find your blind horse will become very attuned to listening, and will develop what we call the "blind horse tilt" … the head tilted at a slight angle, ears forward, listening intently. Your blind horse will still walk on a lead, accept a farrier’s handling, and get into and out of a trailer okay (with a little practice and coaching). Our blind horse Lena will even follow voice commands — we’ll stand in her stall door and call to her across the corral, and she will walk straight towards us, following our voice the entire way, right up to the door. Although the initial period of going blind can cause some anxious behavior on the part of your horse, our experience is that once blind, horses will be very careful and cautious in their movements. Blind horses typically do not run around and get hurt. They know they can’t see and act accordingly. In fact, our blind horses are no more likely to get hurt than our sighted ones. So if you provide a safe environment and keep other animals from bullying it, your blind horse will be a very happy animal … and grateful to you for the chance to live out its life. Yes! Every blind horse wants to enjoy life. It’s up to us to make it possible. Your blind horse will still savor a scoop of grain, try to take a treat out of your pocket, and knicker at the sound of your footsteps. It will want to do everything a sighted horse will do (except unlatch gates!) and enjoy it just as much. There’s something especially gratifying about seeing two of our blind mares, standing out in the pasture after a day spent grazing, leisurely grooming each other in the evening light. No one can tell them that they don’t have a great quality of life! Horses are herd animals with a social hierarchy and a well-defined pecking order. Usually the blind horse falls to the bottom of the pecking order. The others sense the blind horse’s vulnerability and take advantage of it. A blind horse will get beaten up, chased away from food, and run off from the group. It is not a pleasant life. Blind horses can get hurt in a herd environment because with their fight-or-flight instinct, blindness leaves them with only one choice: flight. And fleeing from a bully in the herd in a blind panic (literally) is when a blind horse will run into a fence or a tree and get hurt. We’ve found that even in an otherwise easy-going small herd of four or five horses, it only takes one sighted horse to bully the blind one and you have a potential injury on your hands. The answer is not to isolate your blind horse, but to give him or her a compatible pasture buddy to hang out with. Horses need company, and a lonely horse is an unhappy horse. So we keep our blind horses in pairs, or with a sighted pasture buddy (we call them our “seeing eye horses”), in separate pastures. The rest of our herd – elderly sighted horses – stay together as a group in a different pasture. We’ve seen that even small groups of blind horses can create pecking order problems. A lot depends on the individual personalities of the horses and the ‘social chemistry’ when they’re together. You’ll quickly discover what works and doesn’t work for your blind horse in your situation. Although there are exceptions, in general a herd is a bad place to be for a blind horse. Search for any holes that a hoof can go into and fill them with dirt or gravel. You’ll need to do periodic “hole patrols” to make sure new ones don’t appear (we have gophers and badgers that can wreak havoc in a pasture). Cut down low-hanging tree limbs. fencing off trees and poles with three short corral panels set in a triangle around them. When we introduce blind horses to a pasture or corral for the first time, we walk them around the entire perimeter, tapping on the fence the entire way. We “show” them where everything is, including water tanks and gates, by tapping on them. Blind animals are incredibly resourceful – they make a “mental map” of their surroundings, and then follow this map remarkably well as they navigate around. What kind of fencing should I have for our pasture? If your place used to have cattle on it, you probably have plenty of barbed wire. Barbed wire and blind horses clearly do not mix. Whenever possible, replace it with horse-safe fencing (woven wire/mesh or smooth wire) or other types of fencing: post-and-pole, jack-leg, split-rail, or board. Depending on the size of your pastures and type of property, this can be an expensive proposition: We have spent more than $30,000 on fencing since buying our 160 acres here in Montana, and we are still not finished replacing all the old barbed wire. So each year we tackle a new pasture and spend what we can on fencing. For the blind horse pastures, we have used either woven wire or smooth wire fastened to wooden posts. Some people say that blind horses can “sense” electric fencing, but we haven’t seen any evidence for that. We don’t know why losing your vision would make you any better at detecting the presence of an electric fence. So we prefer not to use it. If a blind horse should touch the fence and get shocked, it could whirl around and panic … and perhaps go right into the fence again. We want to avoid at all costs frightening a blind horse – and walking into an electric fence will do that. What if you can’t afford to replace your barbed wire fence at the moment? First, don’t despair. You can move your blind horse to a corral until you replace the old fence. If that’s not possible, you can greatly reduce the chances of your blind horse getting hurt by making sure there are no other horses or animals in the pasture that could cause him to flee. Blind horses get hurt trying to run away from a bullying horse or other animal. When left alone with just a pasture buddy, they are usually very cautious and careful animals, unlikely to hurt themselves. You can also tie flags or other material to the old fence; this will help your blind horse hear the fenceline when the flags flutter in the breeze. This helps the horse make that “mental map” of the fenceline so it can avoid walking into it. There’s no single right answer to this question, but here’s what we think is the ideal corral fencing for blind horses: lightweight metal corral panels chained to T-posts. We use Priefert’s utility horse panels, although any brand of metal corral panels will do. What do we like about it? These panels are lightweight AND fastened to T-posts, so they flex and bend if a blind horse runs into them. They are also smooth and rounded with no sharp edges. We have seen a 1,200 lb blind horse crash into these corral panels and come away unhurt. We may have to straighten a T-post or replace a bent panel, but we don’t have to call the vet. Priefert says these panels are for “non-crowding” purposes, but for the very reasons we like using them for our corrals: The ability to flex and bend helps keep blind horses from getting hurt. Other alternatives for corrals include woven wire, solid board fencing, metal pipe fencing, post-and-pole and split-rail. However, none of these other fences can flex and bend to the same degree as the combination of panels and T-posts. That depends entirely on you and your horse. If you rode your horse before it went blind, you may well be able to keep on riding. You’ll first have to assess its confidence and level of trust, and then go from there. Even if your horse came to you after it went blind, you may be able to ride it. Again, so much depends on your horse’s own personality and confidence, its willingness to trust you implicitly, and the amount of time you can devote to working with it.